It’s fight week, so every UFC fan knows what that means. 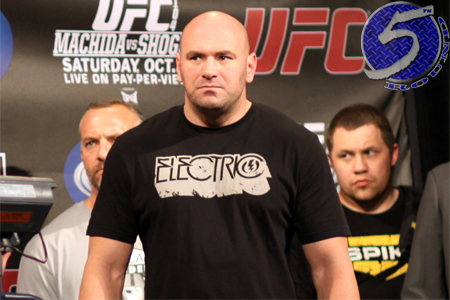 It is Dana White’s (video) blog week, too. In White’s latest vlog, he provides behind-the-scenes footage from UFC 166 in Houston. The most intriguing part of the video takes place backstage when White meets up with Houston Rockets center Dwight Howard. The FORMER Los Angeles Laker tells teammate Chandler Parsons that he’d gladly step in the Octagon for $10 million. White, who never leaves home without his promoter cap, quickly chimes in and says he’d love to promote the pay-per-view. I know Howard’s probably wishing he didn’t leave so much money on the table when he bolted from the Lakers in favor of Houston, but, man, doesn’t he know no UFC fighter has ever made more than $5 million in a single outing? Oh, the in-Octagon video after Gilbert Melendez and Diego Sanchez’s epic tango was also pretty cool, bro.